Roses possess a rare combination of texture, fragrance, form and color that elevates them to royal status among flowers. Known to have been cultivated in gardens throughout history, roses have been grown for medicinal qualities, religious symbolism, fragrance, flavor and beauty. The rose was designated the National Floral Emblem of the United States in 1986. 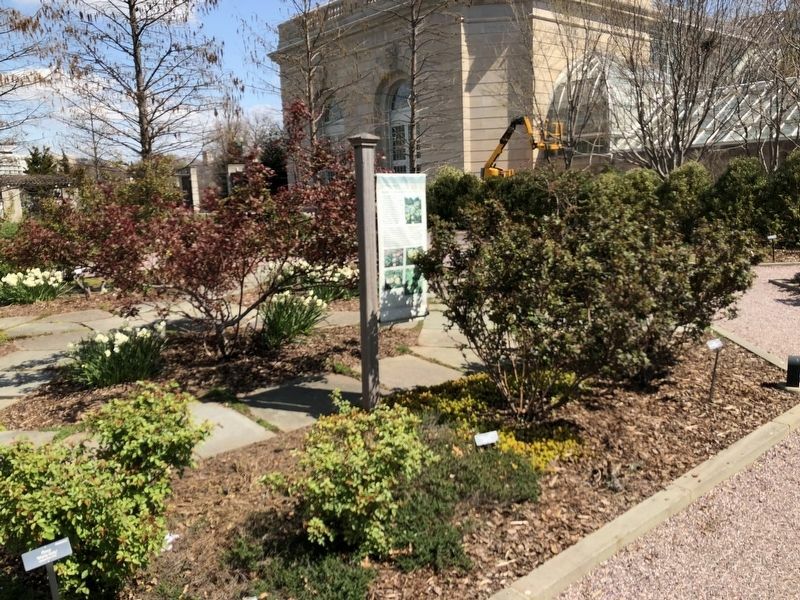 The U.S. Botanic Garden follows a sustainable approach to growing roses. Healthy roses start with good soil. Nutrients may need be needed to improve the soil, a soil test will determine which ones and in what quantities. We select roses that are naturally resistant to the diseases in our area to reduce or eliminate pesticide use. If the particular rose does not perform well or gets diseased, we remove it and try a different selection. It is possible to have a rose garden that is healthy, beautiful, and friendly to the environment. 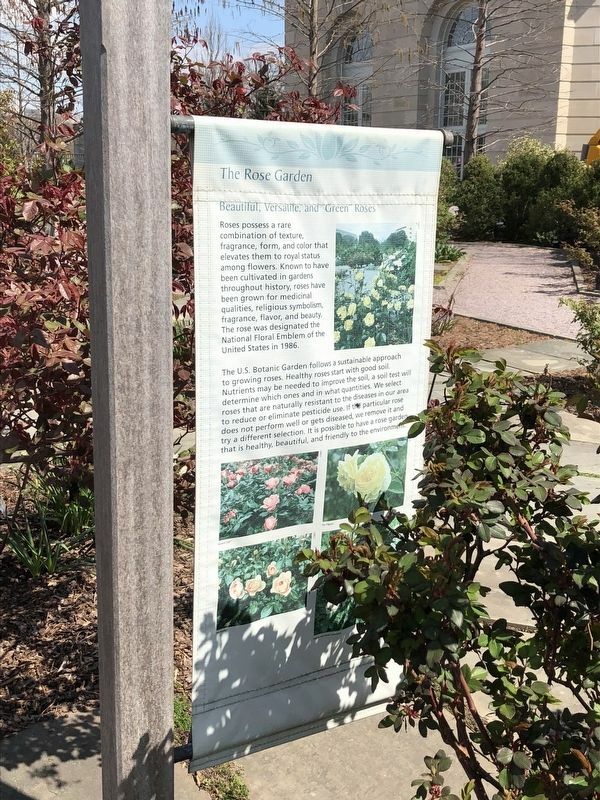 Erected by United States Botanic Garden. , in Washington. Marker can be reached from Maryland Avenue Southwest east of 3rd Street Southwest, on the right when traveling east. Touch for map. Marker is at or near this postal address: 100 Maryland Avenue Southwest, Washington DC 20024, United States of America. Touch for directions. Other nearby markers. At least 8 other markers are within walking distance of this marker. The National Garden Takes Root (within shouting distance of this marker); The Pollinator Partnership (within shouting distance of this marker); Pitcherplants (within shouting distance of this marker); Power from the Wind (within shouting distance of this marker); Green Roof Plants (within shouting distance of this marker); Green Roof Engineering (about 300 feet away, measured in a direct line); Ulysses S. Grant Memorial (was about 300 feet away but has been reported missing. ); Bartholdi Fountain (about 400 feet away). More. Search the internet for The Rose Garden. Credits. This page was last revised on March 24, 2019. This page originally submitted on April 5, 2018, by Devry Becker Jones of Washington, District of Columbia. This page has been viewed 59 times since then and 9 times this year. Photos: 1, 2. submitted on April 5, 2018, by Devry Becker Jones of Washington, District of Columbia. • Bill Pfingsten was the editor who published this page.